At Fleishman-Hillard's annual leadership conference, where the agency's top 250 employees meet to discuss issues affecting the business, the theme this past February was "Switch on. Brilliance." "The vast majority of the meeting was about how interactive media and the digital world is our new oxygen," notes Dave Senay, Fleishman-Hillard CEO. "Understanding how to integrate the offline and online world is not negotiable." Agency executives are echoing Senay's breathless talk about digital media's place in the industry's future. Also known as social media, the digital Web 2.0 movement - which was once a new frontier in the marcomms industry - has become both a rallying cry for PR pros emboldened by a flagging traditional ad model, and an increasingly common tool in today's PR professional's arsenal. While appraising and evaluating social media is often complex, it has impacted the profession in three specific ways (in order of increasing importance): it has added a new medium and hundreds of thousands of new outlets PR pros must ponder when pitching; it has provided companies and their agencies an inexpensive way to push their unfiltered message out into the increasingly cluttered media space online; and it has opened up a heretofore unimagined conduit of conversation between corporation and customer. Perhaps the tipping point in the industry's decision to pay more attention to social media occurred in February 2006, when early adopter Edelman hired Steve Rubel, who ascended to blogging fame while working at smaller PR agency CooperKatz. Though firms, including Edelman, had already been working on social media campaigns, Rubel's hiring was viewed by many in the blogosphere and the industry as a sign that agencies were starting to dedicate significant resources to the growing medium. Waggener Edstrom Worldwide is another such agency, and it was its clients' move into the space that forced the firm to make a significant investment - which it did in the creation of its Digital Strategies Group. "Some of our clients were driving some of the technology behind the shifts in fact, and they and their key audiences were among the first to move into online communities," says CEO Melissa Waggener Zorkin. "So we've been there with them, but this is the year we anticipated that we would see broader demand for influence plans which incorporate aggressive digital approaches." Social media, which takes place both online and off, encompasses a number of techniques and tools, including blogs, podcasts, wikis, Web sites, and word of mouth. And online communities like YouTube, MySpace, Friendster, and Second Life have become a more frequent target of PR efforts. Respondents in this article were asked to focus on the digital components of social media. There is much confusion about the space - and its effect on the bottom line - because there is no consensus on what constitutes social media. Also, there is a difference in what agencies offer in the way of digital media, especially with those owned by holding companies that also have stand-alone digital shops. When asked about business expectations, many agency executives queried by PRWeek look at social media capabilities as a necessity and expertise as a competitive advantage in pitches. Burson-Marsteller CEO Mark Penn convened a digital task force upon assuming that firm's top post in January 2006. "We had first-rate services," he says. "We just needed to integrate them into the firm." "You can see that social media is now approaching the same level of importance as [traditional] media relations," adds Tim Dyson, CEO of holding company Next Fifteen. "It's no longer the fringe part of the PR business; it's core, central, and part of everyone's program." Steve Cody, Peppercom managing partner and cofounder, describes Web 2.0 as the "price of entry" in today's PR industry. "Our mission in the next six to nine months is to get every [staff] member up to a certain level of core competency," he adds. But equally, digital and social media expertise is a fundamental part of the agency makeup for many, not just an add-on or a pitch toy. Says Waggener, "[Our digital investments] weren't add-ons, but result in plans and thinking which reflect the blurring of lines as media converge for total impact." Marcia Silverman, CEO of Ogilvy PR Worldwide, adds, "We have developed a very important practice, called Digital Influence, [that MD of Ogilvy's Creative Studio] John Bell has been developing globally for us, [and] and it's becoming increasingly important," because it complements and contributes to all of the firm's other practice areas. Brodeur has had to evolve its digital expertise with the particular needs of its many b-to-b clients in mind. B-to-b has been slower to adapt to digital than other industry segments, such as consumer and healthcare, says CEO Andy Coville, but even there, "the demand we now have for online capabilities" and blogs has increased. She adds that the firm's investment in digital strategies has "really paid off." The majority of agency executives declined to comment on the record about what percentage of their overall revenue was attributed to social media or the broader category of digital work, citing competitive reasons or disclosure policies. Granted anonymity, the answers ranged from barely 10% to 30%, the latter figure called "ludicrous" by the representative from the agency with about 10%. Another CEO says that because social media work is so embedded into everything the agency does, it's hard to glean any percentage of revenue that serves that function. Those who did speak about their digital practices' revenue prospects say that growth is expected. Penn says that Burson's digital revenue is up 70% from 2005, and that the agency's percentage of revenue from the Web is probably double what it was last year. "I expect [digital media] to be one of the fast-growing parts of our business," says Weber Shandwick president Andy Polansky. "I will not be happy until 25% of our revenues are directly related to digital," Senay says. "The only thing stopping us is capacity right now." Next Fifteen's Dyson says companies are definitely dedicating a healthy percentage of budgets to the space. "Big consumer brands are probably spending 20% of their traditional PR budget on this space, and it's probably rising," he says. "For some tech companies, it can be 60% to 70% of budgets." He adds that some companies and industries are spending less than 10%, and will likely remain fixed at that low amount. But Dyson and others don't expect clients' marketing budgets to increase just because social media provides a new opportunity to connect with constituents. "Marketing departments aren't going to ramp up their budgets [for digital efforts]," Polansky says. "We see this as an evolution of how those marketing budgets will be allocated." "Is this really dramatically changing the bottom line of business? No," says Dyson. "But it's driving the competitiveness of agencies. If you don't have strong [social media] expertise, you might lose clients. It's not necessarily dramatically changing the profitability of agencies, and it's not changing the level of budget. It's not about finding new marketing dollars. It's [about] reallocating marketing dollars." Regardless of whether or not clients are immediately devoting significant resources to new media, agency executives agreed that clients want to know what agencies can do for them. "I think it is part of almost every pitch," Penn says, conceding that the agency once failed to make it a priority in one pitch because the team thought the client wasn't interested in social media. Burson was subsequently told that the winning agency won by best demonstrating new media capabilities. "You should really talk about it almost every time." "Social media is clearly becoming a core component of most of the programs we're undertaking," says Polansky, adding that, in terms of what type of agency will handle the work, "Clients are clear that the best idea wins." The larger agencies now have dedicated social media shops, often under the aegis of the longer-standing interactive practices. 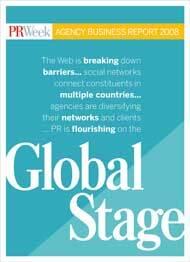 They include Edelman's Me2Revolution, Weber Shandwick's Screengrab, and Fleishman's NGT (Next Great Thing). Many smaller firms and tech shops are eschewing any formalized new media practice, instead positioning the agency as a team of social media experts. Some portray the larger shops as assembling A-Team-like groups that pitch accounts while leaving the day-to-day operations to AEs. Smaller agencies claim that, with their scale, they can easily suffuse social media expertise within their entire employee base. "I take issue with how some larger agencies are approaching social media by thinking about it from a [purely] strategic point of view," says Todd Defren, principal at Shift Communications. "It has become a part of every program [here], and every employee practices social media. We've embedded it across everything we do." "As a big [agency], you can invest a lot of time and dollars into [think tanks], and then you can spend a lot of time to try and blend that [expertise] in," says Richard Cline, Voce Communications founder and president. "The challenge is do you get people to do it? Is there a mandatory meeting at 1 to 3 pm? I think they're going to just get a handful of people to do it." But larger firms say they would like to get all staff up to speed to understand the environment. For one, Senay says NGT no longer serves as "the exclusive domain of digital thinking. It remains our think tank, but the actual breakthroughs occur daily throughout the agency in all corners. "We must become hybrid until there's very little distinction between interactive and traditional PR," he adds. Admittedly, education is a complicated process for larger agencies. "Teaching employees to be- come self-sufficient takes time," says Rick Murray, president of Edelman's Me2Revolution. "But as the adoption rate picks up, the number of phone calls we receive for help decreases. [Employees] are becoming more comfortable in dealing with the space." Both smaller and larger firms essentially are both identifying and establishing, officially or unofficially, a core group of staffers to serve as futurists to track social and digital media innovation. "I would think more progressive firms will definitely want a core group of people who are responsible for keeping up with the latest trends," Cody says. Dyson adds that all agencies would be smart to tap employees with an aptitude and interest specifically in social media to exclusively focus on that area. "It would be a mistake to say to say, 'I'll make those people do a bit of everything,'" he notes. Given the likelihood that clients are becoming increasingly interested in the space, agencies from multiple disciplines are competing for digital and social media accounts. PR agency executives say that since they are increasingly included in pitches that also feature pure interactive and advertising shops, the industry, as a whole, needs to evangelize about why PR is the best discipline to handle the social media space. "PR executives should be embracing social media because we are all about dialogue and discussion," Cody offers. "We're about relationship building and working in uncontrolled spaces [like social media], not controlled ones," Senay adds. Murray says that the Me2Revolution practice sees itself more as an advocate for the industry than an Edelman promotional tool. "We're focusing on a broad scale," he explains. "When you hear us talk [at events], we don't talk about Edelman and Edelman clients, we talk about what needs to happen in the space. The more people that get on the bandwagon, the better it is for the industry." But Coville warns that tapping into society's feelings about technology is every bit as important as mastering the technology itself. "What does it really mean to be able to access 400 or 500 TV stations, or video games on different segments of society?" she asks. "It's about figuring out how people really feel about these things." To get credible, brand-building insight, Coville says, "an ethnographic lens is very, very important right now."